I'll dispose of El Attarine in one sentence: post-evaporation, what I have left consists entirely of bitter-orange marmalade and maple-syrupy immortelle, no top notes, no complexity, and yet despite this fantastically beautiful, which I think can only be a testament to the quality of the ingredients Lutens uses, so one day I shall have to get my hands on a fresh sample and see how much better it (presumably) is. A year or so ago I wrote about Bois et Fruits, one of a collection of variations on Feminité du Bois, the other three being Bois de Violette, Bois et Musc, and Bois Oriental. As I wrote of the four variations at the time, "it is probably the case that you can't properly understand them until you have experienced them all in context": each variation takes the core of FdB, cedar, and dramatically overloads the scent with one of FdB's other elements — fruit, violet leaves and petals, or the oriental or musky base notes — letting everything take a back seat or disappear entirely. But as we know, scents are being rejiggered all the time for various reasons, and it seems to me that the newest iteration of FdB which I bought a month ago has been changed enough that the four offshoots that I have don't seem as closely allied to it as perhaps they once did: there isn't much violet in FdB any more, at least to my nose, making the violet-intensive Bois de Violette seem an outlier in the collection. As with the El Attarine sample, there seem to be pieces missing from two of them, specifically the top notes, just what we would expect when evaporation has occurred. 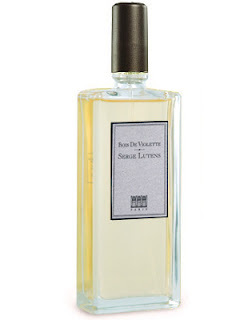 The sample of Bois de Violette is essentially a ton of candied violets on a cedar base, while Bois Oriental is equal parts cedar and a pool of warm, sweet base notes with a suggestion of the usual Lutens spice. Doubtless Bois Oriental is the sort of thing I would love intact, and even in my possibly damaged version it's glorious and durable, lasting for hours upon hours. Bois de Violette is laden with sugary violet, which makes it the most conventionally feminine of the four, and yet violet is such a mainstay of men's perfumery that I don't see why a brave man mightn't wear it either: the cedar keeps it from being merely pretty, and it is fascinating to see the two disparate elements, soft sugary flowers and sharp angular wood, in juxtaposition. My sample of Bois et Musc is clearly the most intact of the lot: a trace of violet, a hint of spicy cooked fruit, and the expected cedar and musk, the latter much more restrained than the bedsheets carnality of Muscs Khoublai Khan. I've never been a serious fan of musk-heavy scents, partly because I'm surely anosmic to certain musks, meaning the scents dominated by them are never as interesting as I think they ought to be. Of the four Feminité du Bois offshoots, my favourite, predictably, is Bois Oriental: I've been enslaved to oriental scents since I can remember, and this one gets it exactly right — dry cedar and sweet balsams to seduce the senses. 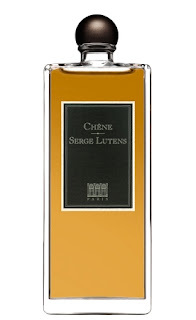 Some time ago I ordered I think fifteen or so Serge Lutens samples from an online sampling company. Two of them had leaked badly in the mail, and the company cheerfully replaced them: all the rest were fine. I stored them with my other samples and occasionally pulled one out to write about, but most of them just sat in their plastic bags in their lightproof box, patiently awaiting my return. Or so I thought! They weren't merely waiting for me: they were transforming themselves, or being transformed. The bottles that had leaked in transit were trying to warn me: they were inherently flawed in some way, as I discovered this week when I decided to choose another Lutens to write about. All of the remaining Lutens samples from my purchase have evaporated to an extent, some more than others. (They were sealed in zippered plastic bags, which are not, I now know, air-tight: the tiny spray bottles certainly weren't.) They're not dregs, some thick oily muck adhered to the bottom, but they're not intact, either. The top notes might have fled, but Lutens perfumes, with their preponderance of woods and balsams and orientalia, are never about the top notes anyway. At any rate, they have almost certainly changed: to what extent I can't say, because I have nothing to compare them to. A clock is ticking: I didn't know it, but it's been ticking for a while, and now that I can hear it, I feel the pressure of time. 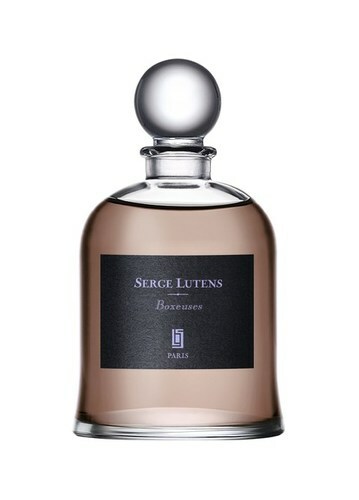 So here's what's going to happen: I am going to rocket through nine Serge Lutens scents in the next few weeks, I am going to sample them all before they depart their little spray vials completely, and I am going to write about all of them, but these reviews are going to be untrustworthy. All reviews are untrustworthy, because they're subjective, but these are going to be doubly so because the vials of scents that I have are transformed by their partial evaporation and so they are presumably not going to be exactly what you would get if you opened a fresh bottle and spattered some of its contents on your skin. This is true anyway of any scent that's more than a year out of the factory: perfumes are active things, they change over time, and they are deliberately changed as well by their manufacturers. Perhaps the Chêne-that-I-have is from an earlier or later batch than the Chêne-that-you-have and even in its intact form wouldn't have been quite the same. We'll never know. All I can tell you about is what I have in front of me and on my skin: it may be the truth, it may be some half-truth, or it may be a complete falsehood, but it's all I have. 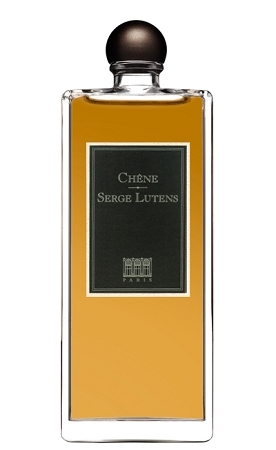 Chêne is the French word for oak, and so if you didn't know anything about Lutens you would assume that Chêne smelled of oak, sturdy and imposing. You would be wrong, however: Lutens can tell the truth (Miel de Bois smells of wood and honey) or he can lead you wildly astray (Cèdre smells mostly of tuberose), but he will generally not deliver exactly the thing you expect. And so Chêne smells of wood, yes, but it, or the reduced version that I have, the version that may or may not smell like your version, is thick and soft, with a suggestion of fruit (nearly inevitable in a Lutens), in this case pineapple, and a puddingy texture, creamy, only lightly sweetened with immortelle. Presumably unisex, as most Lutenses are, Chêne does in fact smell like a men's fragrance with its huge quantities of wood, but there's no edge to the wood at all, nothing freshly sawn or piercing: recognizably wood, but, perversely, wood as comfort food, wood as dessert.